It’s February and we all know what that means! Heart shaped cards, flowers, and chocolates galore! These cards and gifts have been popular in the United States since the mid-1800s. While many feel it has been over commercialized, Valentine’s Day can still be an opportunity to rekindle love or remind your sweetheart just how much you truly care for them. Love isn’t always easy and many will agree that at times it just takes work. Have you ever read 1 Corinthians 13:4-8 and been overwhelmed thinking about living up to that kind of love? That effort is exactly why it is sometimes easier to follow commercialized traditions than to take the time to slow down, put in the work, and truly express love in a way that is meaningful to those closest to you. After many years of marriage, celebrating Valentine’s Day may seem unnecessary or simply a waste of money. Instead of focusing on just one day to demonstrate your love, why not spread the sentiment (and possibly the cost) over several weeks. This kind of love is more along the lines of how God calls us to love. He doesn’t want us to only show our love for others on one day or one weekend a year. Rather, they should know Him by our love (John 13:35). Perhaps you have heard of the 40 day love dare or the 90 day romance your marriage challenge, among many others. Challenges such as these are an excellent way to celebrate Valentine’s Day with your spouse on a much deeper level than a box of chocolates. Similar to the previously mentioned challenges, caring for your loved one’s heart shouldn’t be just a single day of health, but rather a lifestyle of health. The most common risk factors for heart disease are related to our lifestyle. Thinking about heart health on Valentine’s Day is a terrific opportunity to begin heart healthy habits. There are many ways we can significantly decrease our risk for heart disease through lifestyle changes. As you may have guessed, your nutritional intake is one of the major ways you can reduce your risk of heart disease. All around the world, the populations with the lowest rates of heart disease follow a primarily plant-based eating pattern. While these eating patterns are diverse and reflect each culture, they all revolve around plant foods in many combinations, but particularly including legumes. Try incorporating beans, peas, or lentils in your Valentine’s Day meals. Beans can even be a delicious part of a Valentine’s dessert such as these brownies. Hydration is an additional dietary factor that is important for heart health. Dehydration increases stress on the heart by decreasing blood volume, forcing the heart to beat faster in an effort to compensate for the lower volume. Drinking plenty of water throughout the day helps manage blood pressure, reducing stress on the heart. If plain water becomes boring, try infusing your water with fruits and vegetables such as berries, cucumbers, or mint. Another way to reduce your risk of heart disease is by having an active lifestyle. Yes, exercising! While many groan at the idea of exercising for the sake of exercise, it doesn’t need to be that dull. Simply being more active throughout your day can reduce heart disease risk. Think about ways you could be a little more active during your waking hours. Simple things like taking the stairs, parking further away from the store or your office, taking a walk instead of watching another TV episode, riding your bike instead of driving, or taking your kids to a park instead of playing video games. The ways to be more active while still accomplishing your to-do list are nearly endless. Consider using a wearable or an app to tangibly track your activity. With these devices you can see your success, set goals to beat your personal bests, or earn in app badges! Possibly a more interesting way to stay active is to play games or sports. An active lifestyle doesn’t have to be monotonous; it can be fun as well as reduce heart disease risk. Join a local recreational league or engage your family or friends in sports on a regular basis. This type of activity is often more enjoyable for those that do not enjoy exercising simply because they are supposed to for their health. 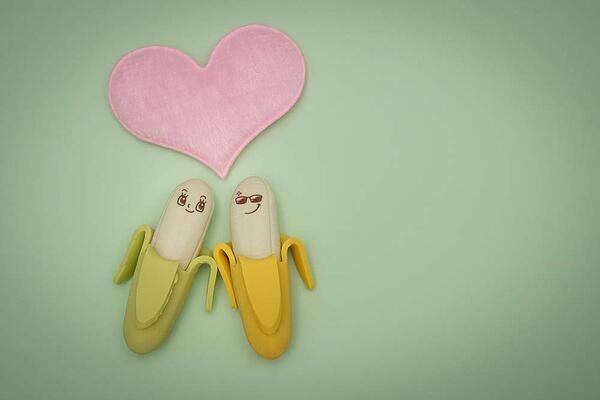 If your Valentine brings you a box of sweets this year, all is not lost! Extend your enjoyment and appreciation of their thoughtfulness by freezing some of the treats. Then you can enjoy them in small portions over several weeks. Each time you savor a bite you can be reminded of the love your Valentine has for you and love your heart at the same time. 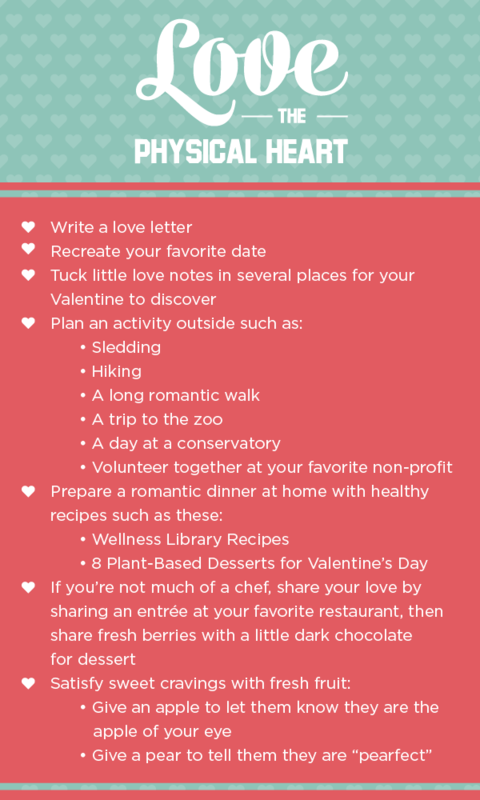 This Valentine’s Day, show your sweetheart how much you love them and their heart using some or all of these tips. Discuss your favorite ways to care for your heart with your loved ones and make a plan to keep your heart healthy all year long! Wishing you a happy and healthy Valentine’s Day, from my heart to yours.